Halena is versatile responsive WordPress theme with modern demos & Visual Composer for building any kind of website imaginable. Incl 6 months support. With fastidious attention to detail, Halenaâ€™s aim is to provide a seamless shopping experience throughout the end. 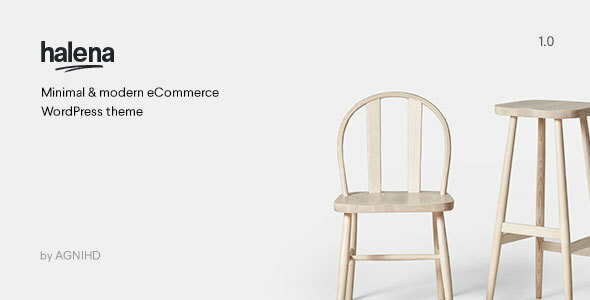 Each & every pages of shop (such as cart, checkout, orders, etc) has been taken extra care for all devices. With over 4 current layouts pre-built right out of the box, and the easy to use Demo Importer, you will be up and running with no fuss in the shortest time possible. Each demo has a unique set-up designed with different types of business models in mind, so that all the hard work is done for you. Halenaâ€™sÂ templatesÂ Â­Â noÂ coding required. Most complete ajax filter theme on themeforest. You can even check multiple attributes with AND/OR query choice. Simple & straight forward quick view which has lot of rooms to grow. Halena includes responsive hotspot pins shortcode. You can add single or multiple pins for any images. hotspot pins are ajax enabled. so you can have the experience as you have on normal shop page of halena. Well crafted Visual Composer comes with Halena. You can also turn ON all basic modules of visual composer. Simple drag & drop is enough to create a beautiful template. You can built blocks in the same way you do for page. And each block will act like a shortcode so you can place the block almost everywhere. 4 Unique sliders have been created especially for Halena. Even you can create your own slider using revolution slider. we also provide any revolution slider examples on request which youâ€™re seeing at Revolution slider pluginâ€™s page after purchase of Halena. Halena has been tested completely with WPML & qTranslate X plugins. It also has an unique language bar at header menu. You can choose the fonts individually for all H tags, body tag. You also can include your own fonts/typekit fonts via unique tools which comes with Halena. Halena comes up with 5 font libraries linea, stroke, ionicons, font awesome, medical web font icons. You can pick any icon from the list of 2500+ and you also can upload your own svg icons. Let your visitors notify youâ€™re unavailable or youâ€™re preparing to launch by turning a switch ON. Halena uses Redux framework which helps you to control almost everything with help of user-friendly interface. 4 different layout Side layout, Fullwidth layout, ZigZag, simple are available for portfolio single page. And you can also use visual composer along with those layouts. By mixing the masonry, sidebar, column options you can create over 30+ Blog & Portfolio layouts. Halena completely compatible with language like Hebrew, arabic.